Part 1 and 3 function as independent works and can be seen as such. But 1 and 3 are connected by the newspaperlink and creates a third field, a third work. Only when you have experienced all three parts, will the third work onfold. 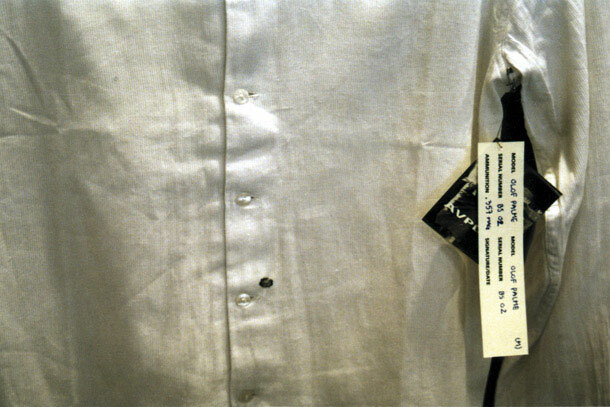 The third work is a disintegration of Searchlight and AVPD.clothing, through the newspaperlink the two works affect on each other, continous giving new solutions to the works, but at the same time asking new questions, giving new possibilities. Searchlight is coming out of our considerations described in the preceding text, the idea about an active approaching artwork. 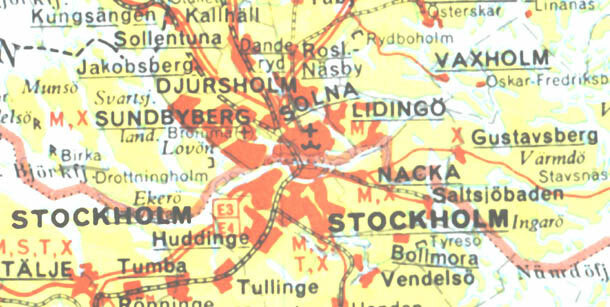 The frame for Searchlight is Stockholm city after break of night, and runs in the first week of the exhibitionperiod. 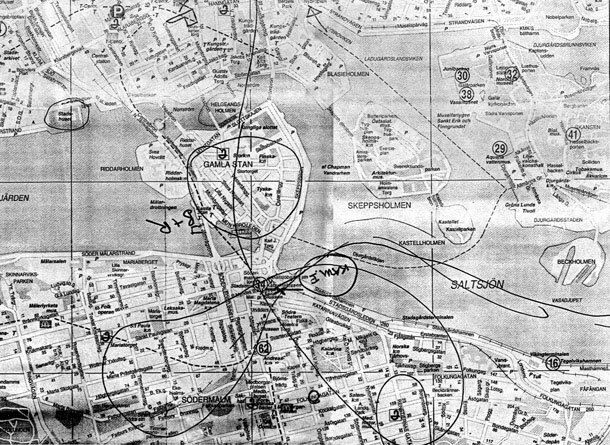 With a helicopter mounted with a strong searchlight, we will, from unknown position, make three flyovers of Stockholm with the searchlight switched on. The flyings are spread over three nights 5/2, 5/4 and 5/5, each lasting approximately 30 minutes. Afterwards the helicopter disapear to an unknown landing position. The action will not be proclaimed to the public previous to the actions. connect it with reality and will probably search for documentation and causal relationship in the following days newspapers, television news, in the radio or by other people. The incident will presumably form pictures of helicopters seen in policeseries, action movies, "X-files", "rescue911" and following create associations to crimescenes, robberies, homocides, hostage situations, rescue situations and so forth. A narration is being build in the persons mind, she tries to get hold of the incident but is left without an answer! 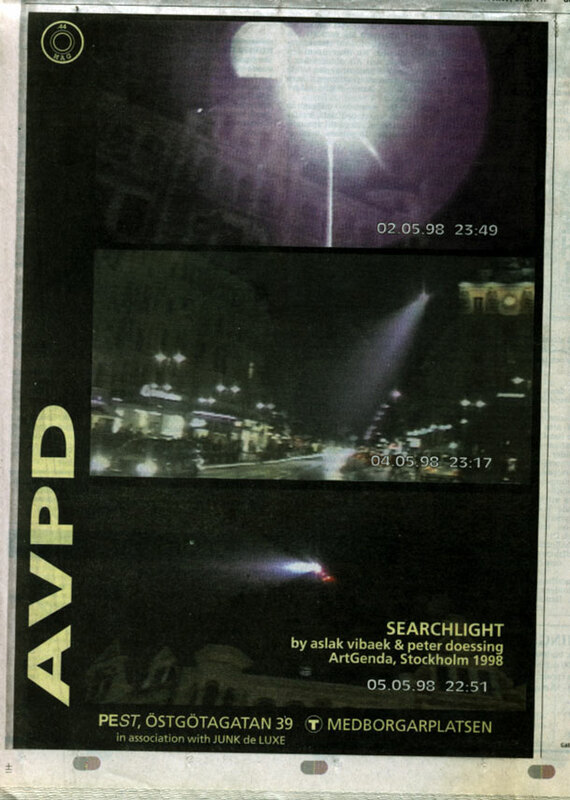 In the big Stockholm newspaper Dagens Nyheter, the day after the last helicopter flyover we insert a quarto page photographic documentation advert.The person who has experienced the helicopter incident has until now been left without answer, but in the article are three photographs of a helicopter with the searchlight switched on. The date and time of the photographs are shown on each and on the last photo is also given the name of the work, the artists names and the exhibition context. Hereby is given an asnwer to the incident: "it's an artwork", this gives a framework for explanation, an understanding. But beside the answer of the helicopter incident, the article holds a new question. 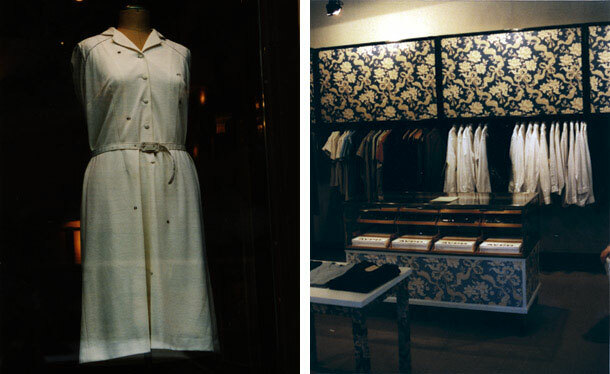 The name of someone/somebody who is called AVPD and the adress of a wellknown clothing store in Stockholm, Soedermalm, an information meant to draw the person to the clothing store to find the final asnwer. 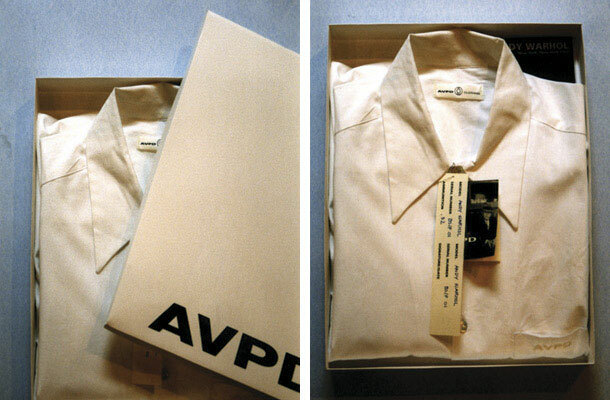 AVPD.Clothing is to be seen as a continuation of the project exhibited in Aarhus, May 1997. 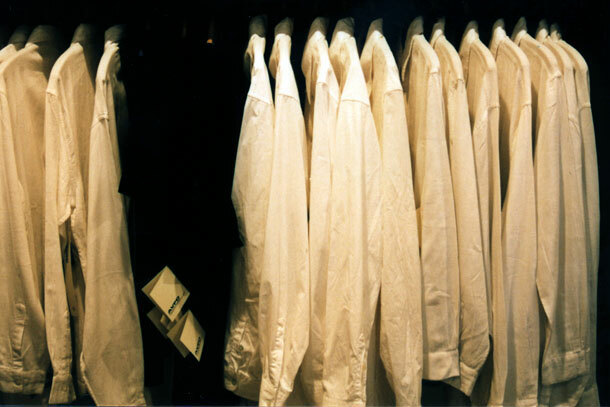 The installation of our clothing products is sitespecific and followes the specific aesthetics and systems of the shop PE ST. Our products are hanging side by side with the other products in the shop. The possibility we offer to the buyer of a shirt with a shot design, is to follow their idol as close to death as possible without actually dying. By carrying the marks of death one can show the ultimate devotion to the deceased and the ideas and stories connected to her. 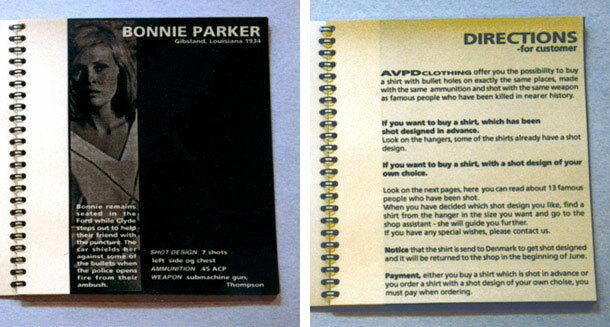 In the way AVPD.Clothing is carried out, made and placed in the shop context (selling being the keyword), it's placed on the borderland between art and design, and following trying to examine where the destinction between art and non-art is, which things or conditions make the difference.